The whole outfit is gorgeous. Love the photography too. I die every time I see you in a full skirt, so gorgeous! Great look! I love your photos too! Hi KT, I love your style and your confidence. 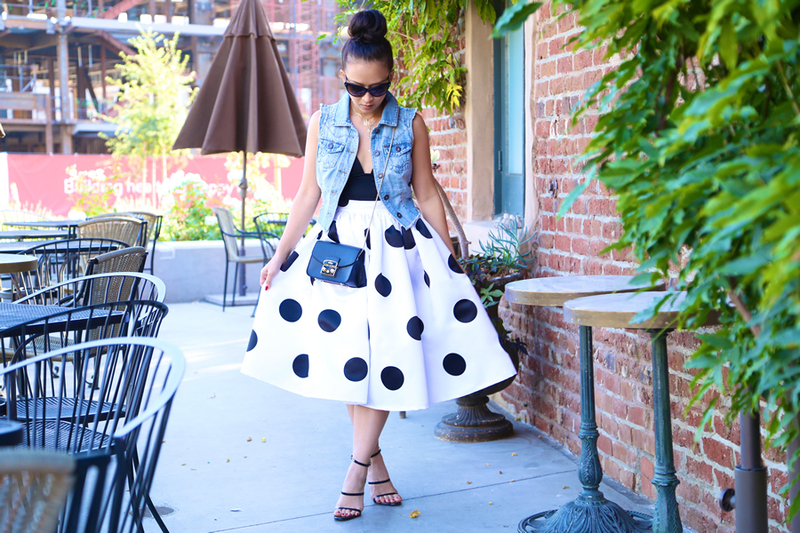 I have been wanting a long midi skirt and always felt like I’m too short for it. I think you are petite like me. You make me want to wear longer skirts and feel confident about it. Thanks again for helping me with my emails and questions. You are so nice and helpful. I really appreciate everything and I wish you the best with your brand and your blog. I’m a HUGE fan of you!! Omg this skirt! What is the length? I want to order but I’m 5’8″. Can you tell me how tall you are?? I absolutely love this skirt! Just placed my order and I can’t wait to get it!!!! 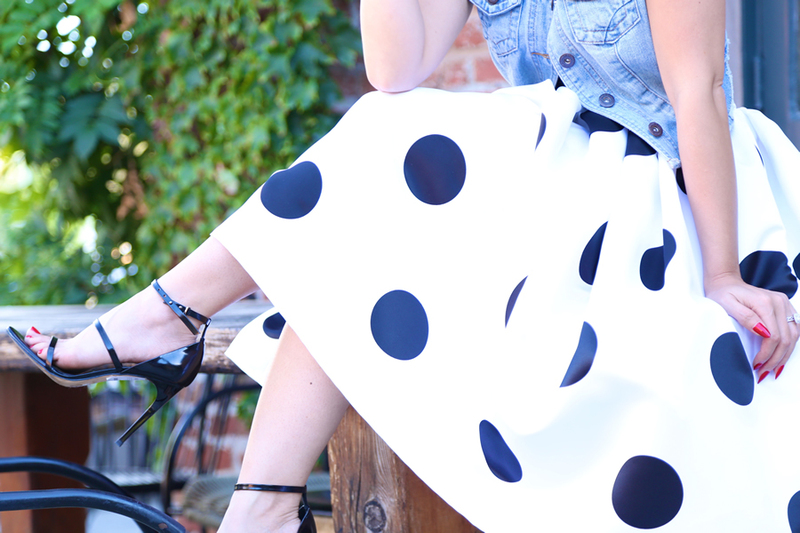 this skirt is SUPER adorable. love how you paired it with a denim vest. First of all I adore your skirt and love you casual take on styling it. 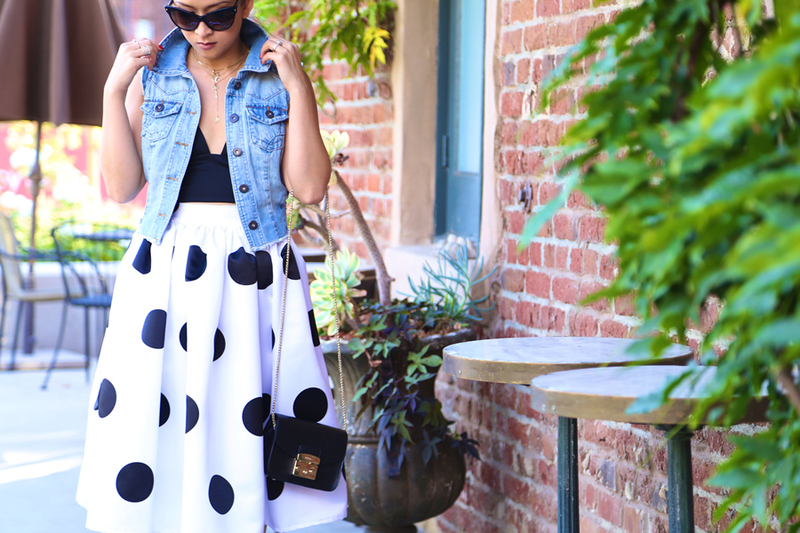 I absolutely love polka dots too! It’s so true that they never go out of style :-) The scale of this print is so bold and unexpected. I love it and you look amazing in it! Thank you for sharing! Love this chic outfit, you look great! Lovely skirt!